To Love What Is is her latest gem, an account of what happened after Shulman’s husband suffered brain damage from a fall—it will appeal to anyone who enjoyed Joan Didion’s The Year of Magical Thinking. Heresy, I know. But there you are. What I felt about Didion’s book [just to clear this up] was that rather a lot was missing. Here is what happened, she tells us, here is how mad I was with it, and we empathize, we’re with her, but after a while I wanted not just to read lists and repetitions of her [understandable] mania but for her to offer something deeper, how she felt and how she was changed by this extraordinary period in her life. I thought its honesty was bordering on superficial and maybe she held back because she simply wasn’t ready or able to give more. Her prerogative of course, but then why write a memoir? I actually read Year of Magical Thinking twice because I couldn’t believe I was the only person on the planet who didn’t wholly embrace it. And then I stopped trying, and I began to wonder how it would rate or be discussed or ignored had it been written by an unknown. In other words, was the buzz created by the magic of Didion’s words… or was it our interest, and faith, in a beloved literary icon? Shulman’s book, for whatever reason, didn’t elicit the same widespread reaction. At least I don’t recall it being discussed and applauded ‘everywhere’. Too bad. It’s an excellent piece of writing on a subject that has broad interest. As in Didion’s book, things begin with a moment between husband and wife… after which everything changes. Shulman dips into the past only enough so that we understand who her husband was [a sculptor, among other things], what their marriage was made of and how his limited recovery affects every aspect of life. In the course of years—from event to completion of the book—she meets with countless doctors, reads tons of material and manages to condense it in a way that we begin to understand the mechanics of brain function, the various effects of brain injury, impact on memory, and how her husband Scott, while able to recover to the degree that he resembles, outwardly at least, an intelligent, charming, normally functioning man of his age, no longer has any concept of how a coat is buttoned. She writes of the time it has taken to arrive at this point, the dedication on both their parts, but doesn’t play the victim card, not even once. Though she admits to exhaustion, frustration, fear, doubt, cowardice, she does all this without ‘drama’. Shulman doesn’t do drama. Aside from all else, the book broadens our understanding of brain injury and aspects of memory loss. Shulman takes us to the brink of hard decision-making, not in a dithering way, but clearly thought out. She reads each passage of the book she’s writing [the one we’re reading] to Scott, and for as long as he can remember it, mere moments, he is able to comment honestly and intelligently. And this means everything to her. They return to the Nubble, the cottage off the coast of Maine where the accident happened. This is also the setting for Drinking the Rain and a place on earth that is almost sacred to Shulman. She can’t bear the idea of giving it up. Or giving in. The title refers to many aspects of her situation, including the future, whatever it may bring—and I close the book hating the inevitability of what that future may hold for Shulman, but by then I’ve been assured, too, by her courage and straight up love of life, that whatever is thrown her way, she’ll manage to find the joy. And all without a trace of saccharine. And there it is, the challenge of memoir: how to write without myopia [or sticky sweetness in the case of love and loss… or to over-compensate and become one dimensional— self-protection disguised as aloofness, or vice versa]. Easy enough to circle the area but to venture anywhere close to that precarious edge without losing balance is the trick. And this, I suspect, has less to do with the brilliance of the writer than an ability to manoeuvre through the fearful territory of honesty without constantly looking in the mirror… or, worse, over one’s shoulder. 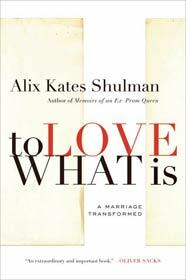 To Love What Is, is available online at Blue Heron Books. Support indies! This is a wonderful review on a book and an author I have never heard of. I will have to look her up! Will recommend it to my book club! Thanks. If you read it, let me know. Carin, I MUST read this book that inspired this writing of yours, such a thoughtful and insightful post. Thanks, Cheryl. I adore her work. That sounds well-done. I enjoyed One Hundred Names for Love: A Memoir by Diane Ackerman but she glosses over in a line here and there the harder times, focussing on progress but his prognosis ended up playing out better. Sounds interesting, Pearl, thank you! I think it must be very hard to keep emotions balanced in writing this kind of thing. I’ll definitely look for the book. Cheers!